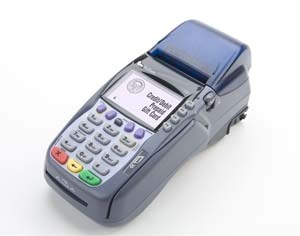 Verifone is the oldest and one of the largest producers of credit card processing equipment terminals. They are very reliable and efficient. The Verifone Vx 570 is great because it provides an all-in-one machine so there is no need to purchase a separate pinpad or printer to use it. This makes it compact and very easy-to-use without stray equipment and a variety of way to communicate to the processor.